After merely a few weeks of training our Culture Champions broadcast their first radio show on ALLFM and they were amazing!! 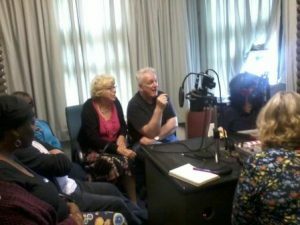 Culture Champions are part of the Vintage FM project in which we’re partnered by; Age Friendly Manchester, The Royal Exchange, Manchester Art Gallery & The Whitworth Art Gallery. The project is supported by The Baring Foundation, Anchor Housing and Manchester City Council. The aim of the project is to promote and encourage participation in culture for older people in Manchester.